The heart and soul of my client's website. Not only does it display all of the product listings (1,400 ) and allow for near endless customization but the forms give the entire team a standardized method for adding, editing or deleting products as their lineups change. Couldn't have built the site without it! Taking image uploading from the slow lane to warp speed. This sweet little add on saved us hours of data entry time and allows us rapid access for adding and deleting the hundreds of images we use on our existing product lines. 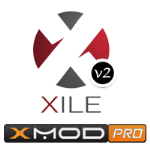 You need XILE, you need it NOW!